Follow Biscuit and the little girl as they make a very special present for Grandma and Grandpa–a Christmas photo album filled with alll of their favorite Christmas memories!At the end of the book, there is a special section to add your own holiday memories, making this Christmas treat a warm holiday keepsake. 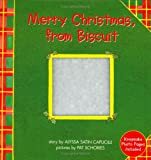 This entry was written by saurabh, posted on March 16, 2010 at 5:45 am, filed under Baby-3 and tagged Ages 3-5, Alyssa Satin Capucilli, Animals, Baby-3, Binding (binding), Biscuit, Book Characters, Christmas, Dogs, Farm Animals, Fiction, Hardcover, HarperFestival, Holidays & Festivals, Pets, Popular Characters, Printed Books, Refinements, Unlaunched Refinements. Bookmark the permalink. Follow any comments here with the RSS feed for this post. Both comments and trackbacks are currently closed.